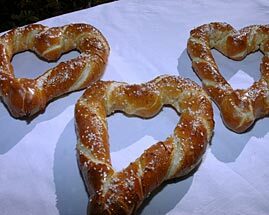 Making pretzel hearts together is a great way to say I love you with a valentine treat that won�t fill the family up with sugar. Combine all ingredients in a plastic re-sealable bag. Partially seal bag, push out as much air as possible, and seal bag completely. Take turns pushing and squeezing the bag to knead the dough for 10 minutes. To make the dough kneading more entertaining, play �Who Do You Love?� while you knead. The person kneading the bag of dough thinks of a person (or something if you want to make it tricky) he/she loves and the other family members can ask up to 20 yes or no questions before they have to guess. The family member to guess correctly gets to take over the kneading and think of someone he/she loves. Turn dough onto a lightly floured surface for final kneading and cover with a bowl or cloth. Let dough rest 30 minutes. Use this time to decorate cards or prepare decorative wrappings for the valentine pretzels that will be delivered to neighbors and friends. Course salt, cinnamon & sugar, poppy seeds, sesame seeds, Parmesan cheese, or favorite topping. Beat egg and tablespoon of water and brush pretzels with mixture then sprinkle with desired topping. Bake at 350 for 15-20 minutes or until golden. Cool on wire rack. Topping Suggestion: To make Red Salt, simply add a few drops of red food color to a small jar of salt and shake it up�Valentine�s Day Salt.